2017 15" Macbook Pro RP560 + [email protected] (Razer Core V2) + Win10 // External LCD, 100% plug and play, no scripts! System specs - 2017 15" MacBook Pro with Radeon Pro 560 dGPU. 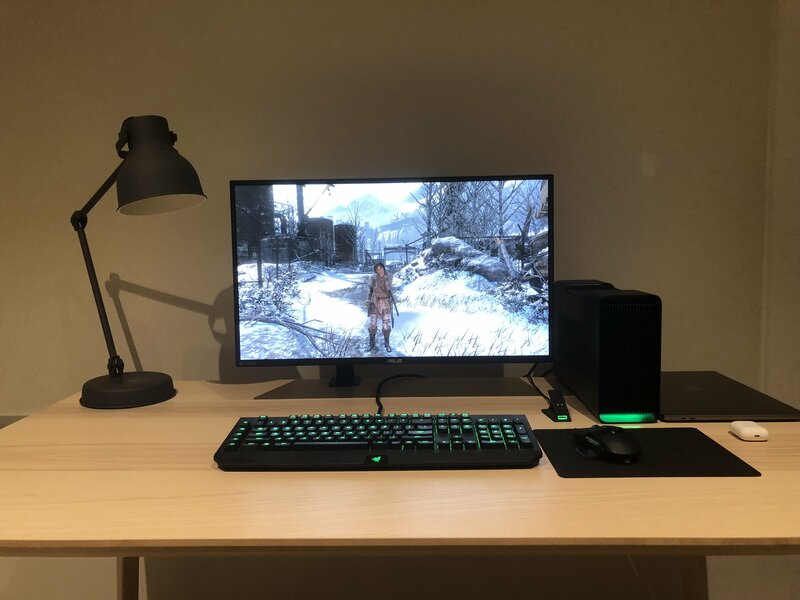 Installation steps - I have been trawling these forums for the good part of the past year, waiting for the perfect time to leap onto the eGPU bandwagon. This was initially too daunting for me due to the significant workarounds required (and the associated risk involved) in the DSDT error 12 fixes, forced iGPU internal display attachment with apple_os_set.efi and integrated.bat, etc. 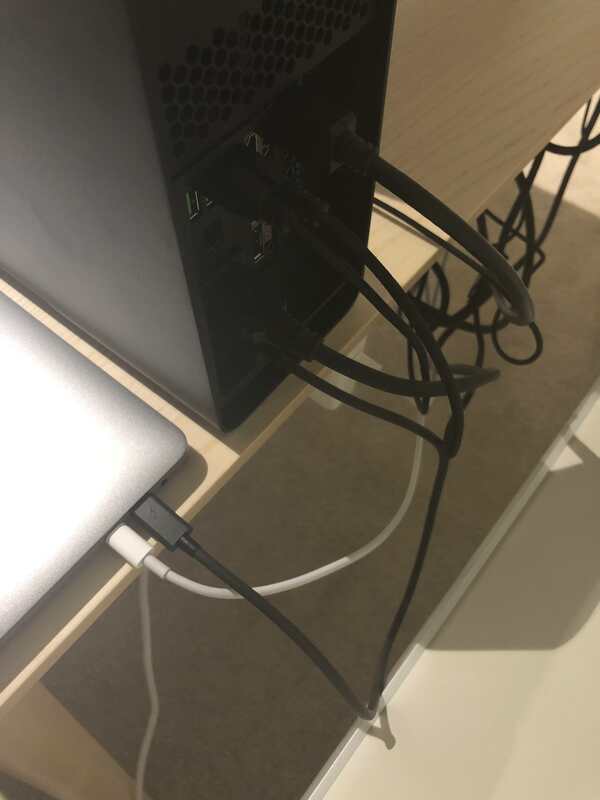 I just wanted a simple plug and play setup where I can have my MacBook pro to carry around for daily use, and when I get home, I can just plug it straight into the eGPU and turn it into a fully fledged desktop setup. 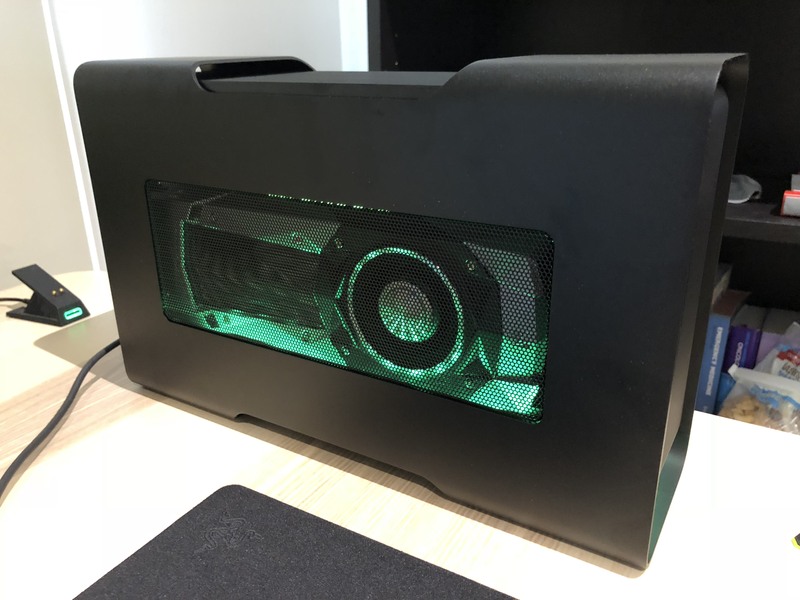 The game-changer came when this eGPU.io article provided an update that Apple had done some firmware updates on the 2017 MacBook Pros and that Windows shows "Large Memory" under Device Manager -> View -> Resources by connection. I've since decided to take the plunge. *** The above steps were already done on my computer from last year. I did not have to reinstall a fresh copy of Windows or anything of the sort. - Windows will detect the razer core, and in my instance, also the GTX 1080TI and auto-install the relevant drivers. I didn't cancel this process. - Update to latest Nvidia drivers off their website. - Plug in external monitor to the GTX1080TI. - Go to the NVidia control panel and choose the correct resolution and refresh rate for your monitor. 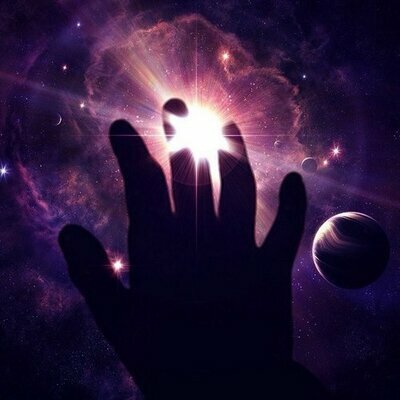 - Now you have the option to either use the MacBook pro's internal display along with the external display using the extended display option in the display settings, or as I have opted to do, use my MacBook pro in clamshell mode. - To get clamshell mode working, you need to go into the Settings -> Power and Sleep -> Additional Power options -> Choose what closing the lid does -> Set to "do nothing". This will ensure the MacBook does not go to sleep if you close the lid. 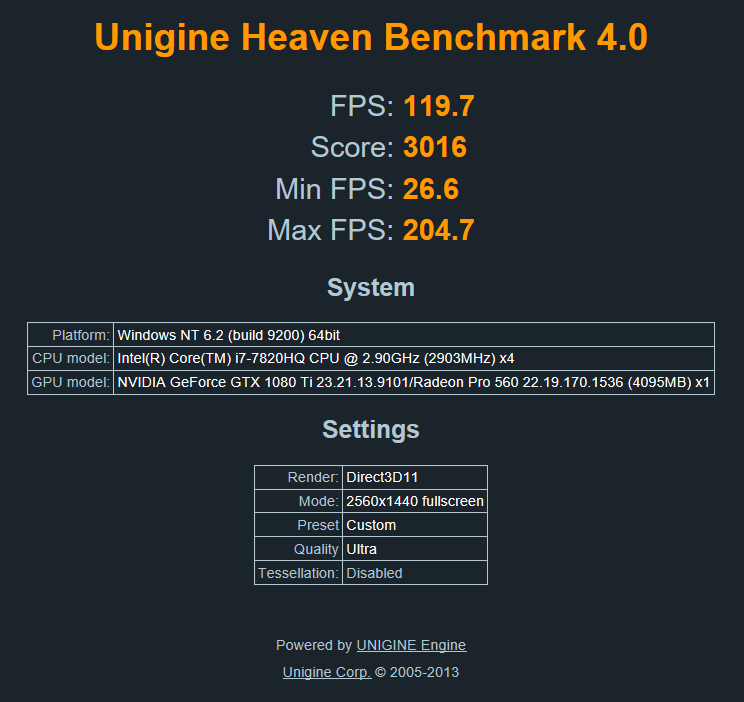 Benchmarks as above: Unigine Benchmark (benchmark was done on external monitor plugged directly into the 1080TI via displayport cable. The external monitor is an ASUS ROG Swift PG279Q 27" 1440p 144Hz IPS G-Sync monitor. For an example of an actual gaming scenario, I can play overwatch on 1440p with maximum settings and achieve >150FPS, which is incredible with this monitor (my first time using a high refresh rate monitor). Dat buttery goodness. - Although having no idea what I would get out of this setup, I am relieved that it is plug and play as I had hoped for. - The razer core V2 USB ports work perfectly (which I understand was an issue with the 1st gen core). I have both my keyboard and mouse plugged directly into the core V2 with absolutely no input lag or issues whatsoever. - Note that you can remove the thunderbolt cable whilst in Windows without crashing but replugging it in while in Windows will cause a reboot. Therefore I make a habit to turn the computer off before I plug in the thunderbolt cable. No need to wait for the spinning dots on boot to hot plug it, just plug it in whilst it is off and it will work fine. - I also bought a Newertech headless HDMI adapter to try driving the internal display. This works perfectly. Basically just plug the headless HDMI into the graphics card as if it was a monitor, then go to display settings (or use windows key + P) to toggle into extended display mode. You will need to set the fake external display to your primary monitor, and then run games in windowed mode and use windows + shift + left/right to move it to your internal display (second monitor). - I then used Borderless Gaming to remove the window for that fullscreen look. - At the end of the day, this went against my goal of a true plug and play setup, as it was still (very mildly) fiddly, so I abandoned it for an external monitor setup. The framerates are also significantly crippled when using the internal display. Any chance you could run the SteamVR Performance test? I have the exact system and am looking for a solution. This plug-n-play thing is exactly what I'm after. I'm glad you got it working and appreciate your documentation for the steps to get there. Ha, think I just replied to you own reddit... I tested PUBG on my set up (links in sig) which is a far less powerful one than you are planning..
hey there, thank you so much for sharing your set-up. Question. When you say the "internal display significant produces frame drops" when using internal display, like how big was the hit? Are we talking 10-15 fps? or more like 30 fps or more? Thanks!